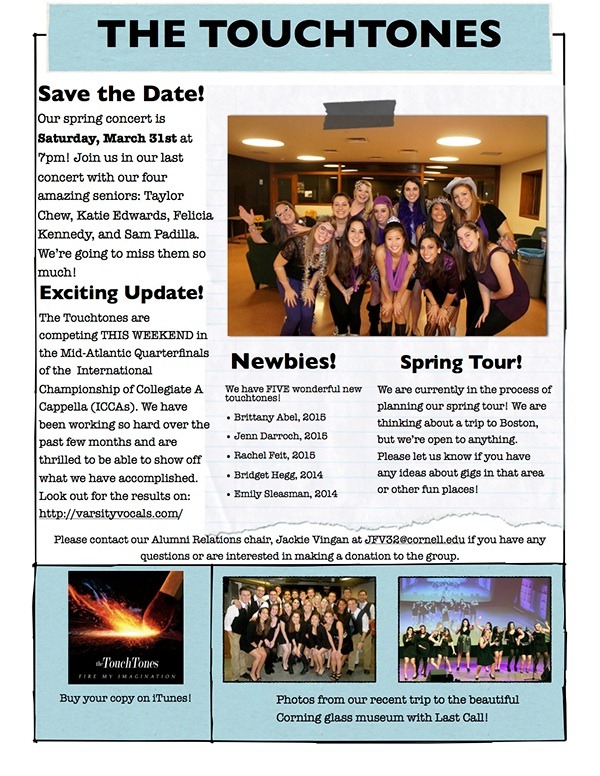 During the weekend of April 20-22nd, The Touchtones traveled to Boston, MA for their spring tour. They sang all over Boston from the suburbs to the city. Below are some pictures of our trip. Enjoy! The Touchtones take Harvard Square, Cambridge! Touchtones pose before singing at the BU Sweethearts Charity Concert at BU. Check out videos of our concert below! Below are some photos and videos from our past concert. Thanks to everyone who came; we had a blast! Fall 2011: Meet up with Alumni! While on tour in New York City during Fall 2011 we had an alumni gathering to bring present and past Touchtones together! It was so wonderful getting to meet everyone, and we hope to meet more alumni soon!